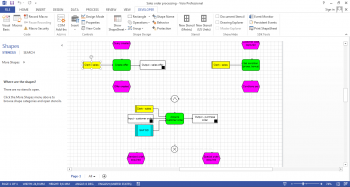 The BPM-X® model translator tool is developed to read and write native Visio® VSDX diagrams. The BPM-X® tool can translate from tools such as Software AG ARIS® Business Architect, OpenText ProVision®, IBM Rational® System Architect, CaseWise Corporate Modeler or many other Enterprise Architecture (EA), Business Process Analysis (BPA) or Business Process Management Systems (BPMS) directly to Visio VSDX diagram files. The business analysts or architects can facilitate the import of existing diagrams and mass import legacy Visio diagrams into their leading repository. The import is done by a BPM-X Analyzer for Visio tool that reads existing Visio diagrams and generates a configuration that can be fine-tuned for a mapping of a legacy diagram like Flowchart into BPMN or EPC. The Visio 2013 file format is now based upon Open Packaging Conventions (ISO/IEC 29500-2:2008) standard. Basically this is a structure of XML files stored in a ZIP package. The following graphic shows how a very basic diagram with one page and one master is stored hierarchically in the ZIP archive. XML data can be read by an intermediate developer, but writing this data back to Visio 2013 (.vsdx) format in a consistent structure with valid content is quite challenging. The BPM-X team spend 12 months of development and testing to ensure full featured export capabilities. 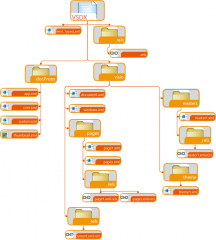 This allows us to natively write the new Visio (.vsdx) format. Visio 2013 drawings can be created based on models and diagrams coming from tools like ARIS, ProVision, System Architect or many others. This allows organizations, system integrators or consulting firms to publish their work into the famous Visio format in order to share models and diagrams with business lines or customers. By using a rules engine BPM-X has developed an add-on Designer for Visio 2013. Designer enables Visio 2013 to do real modeling following the leading standards of the mentioned tools: ARIS, ProVision or System Architect. This allows organizations to use Designer for Visio 2013 and map business processes while being compliant and compatible with the modeling language of the leading tool and providing seamless bi-directional exchange of the Visio diagrams with a central process or enterprise architecture repository. A new cool feature of Visio 2013 VSDX format is the rendering in SharePoint 2013 using Visio Services. In addition we can use the Visio Data Graphics to visualize KPIs in process models loading data directly from a data source. 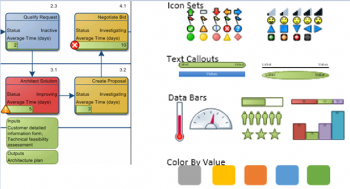 Visio Datagraphics allows cool visualization of KPIs in process models. This allows to build Dashboards in SharePoint with drill down from functional to operational process levels showing the performance of an organization.